Almost immediately Corelli was rumoured to be the author of the book, and just as quickly she denied it. 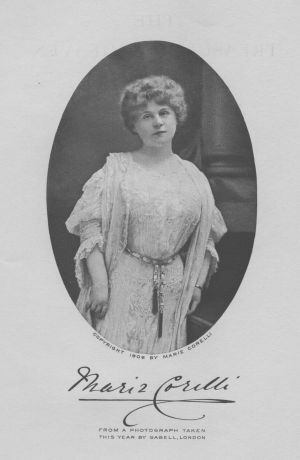 Although she continued to write novels that the public adored, the bad feeling in the publishing world over the savaging they had received affected Corelli personally. Her old publisher and friend 'parted company' with her (or dumped her unceremoniously), possibly as a response to the chapter in The Silver Domino 'Describeth the Pious Publisher' which includes the following on the relationship of publisher to lady authors: 'he has no cause to love you or ask the Almighty to look after you, unless he is making a "good thing" out of you... He does not mind lunching with you - oh not at all. 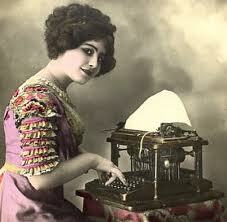 And while at luncheon he advises you, patronisingly safely, as to how you should write your next book.' Ouch. 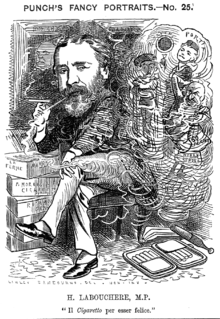 The description of the treatment of women authors is particularly harrowing: 'He tells them first how well they are looking - his next step is to call them 'my dear' ... Even the fiercest, ugliest "blue stocking" that ever lived is conscious of a nervous quiver through the iron fibres of her soul, when the fat, unctuous, kindly pious publisher, unawed by her stern features, says "my dear"...' (pp.211-216). No wonder people wanted to know who could publicly say such things, but possibly after reading that the bigger mystery is how they could have imagined it was a man. "My dear __, I thank you heartily for your kind letter and welcome gift. You do well not to care for fame. Modern fame is too often a mere crown of thorns, and brings all the vulgarity of the world upon you. I sometimes wish I had never written a line. Your friend, Tennyson." Tennyson commands a lengthy section of The Silver Domino, 'Of Certain Great Poets', about his shunning of public life. In it, the author pleads with the Laureate to allow a little worship because the public loves him. 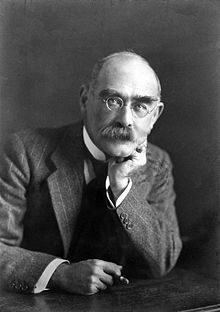 It is a really interesting piece because despite the odd cheap joke such as 'I do not want a lock of your hair or your autograph, for the autograph I have in your own letters and certainly you cannot spare any hair just now', it speaks to anyone who has ever hero-worshipped an aloof figure. With all of The Silver Domino, you are waiting for the knife to go in, but I found it a rather sharp commentary on the relationship of author and reader. The text argues that readers deserve access to authors on a personal level because they take the time, effort and expense of allowing the author to tell their story. 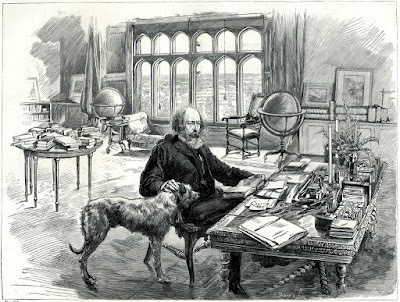 An audience who expresses nothing but love to an author should be allowed to express that personally or at least the author should acknowledge the truth of the relationship - 'You treat with ill-mannered, 'touch-me-not' disdain the very people whose faithful admiration gives you all the good things of this life which you enjoy.' 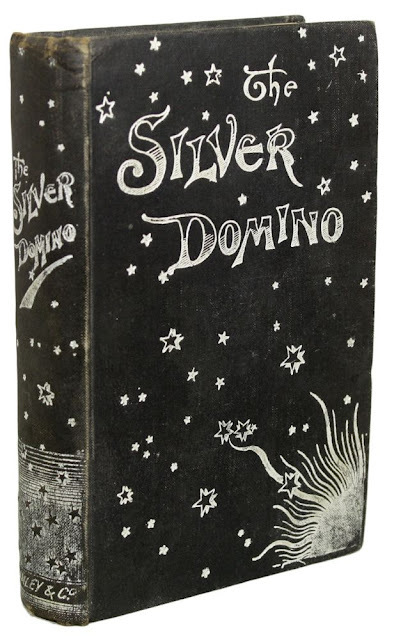 If you have ever loved an author for the books they wrote and longed to tell them so, The Silver Domino offers a justification for your desires. 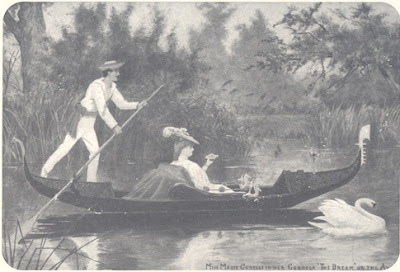 Marie Corelli and her gondolier, at Stratford upon Avon. No, really. Back to the author. 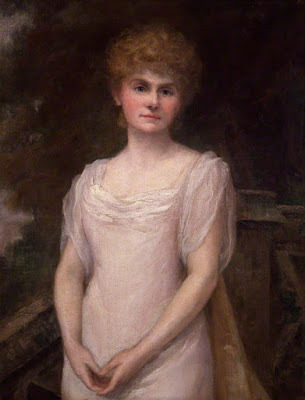 In 1898, Lady's Realm published a piece on Marie Corelli, quoting a letter she had received from her chum Tennyson, after she had sent him a copy of one of her books. It didn't take people long to spot that her letter and the one in the front of The Silver Domino were almost identical. 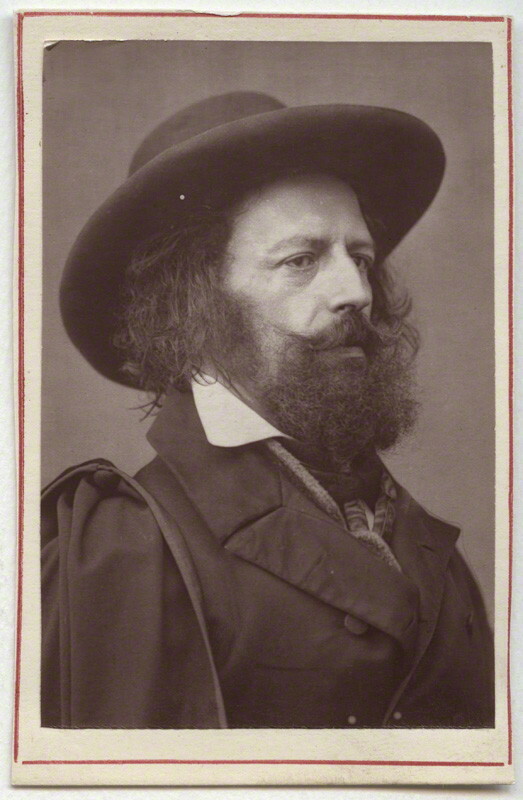 An uproar sprang forth between people mocking Tennyson for being caught writing 'stereotyped form of note to all intrusive literary figures', mocking Corelli for treasuring what amounted to a compliments slip, and those that tentatively suggested that maybe, just maybe it was proof that Corelli was the damned elusive Domino. With Tennyson deceased and Corelli still living, denying authorship vigorously and able to sue, nobody bothered to press the matter further. 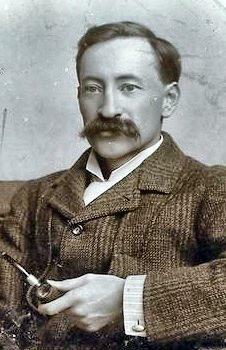 By the time of the next edition in 1902, the author was again thought to be male and that is how it was left, despite people suspecting the truth. I like The Aberdeen Journal's final take on the whole business - 'By and by no doubt the public will come to understand the ways of the modest persons who 'do not care for fame', but yet somehow contrive to never miss a highly remunerative notoriety'. Ouch, worthy of The Silver Domino herself. An interesting tale! I was inspired to have a quick look on wikipedia. She does sound a bit of a character! Apparently there is a film called Angel starring Rolola Garai which is based loosely on her. 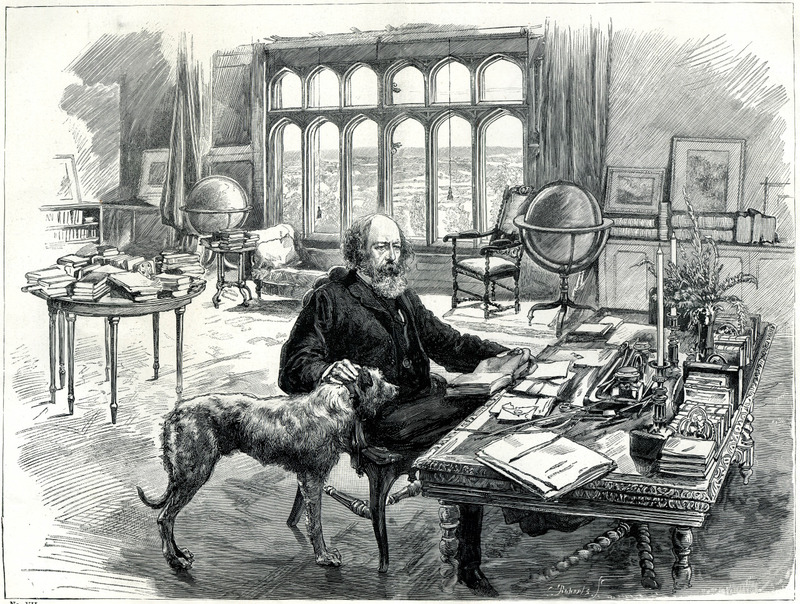 Regarding Tennyson and correspondence - I think I read somewhere that having to answer letters was the bane of his life especially as so many were accompanied by books or poems and asking for his opinion of them. His practice was to reply with an acknowledgement immediately so that people wouldn't expect him to have read the stuff or give an opinion on it yet. I wouldn't be surprised if he did use a standard letter though what you quote above sounds quite personal. I adore that film, especially Angel's publisher struggling to cope with her fantastical stories. It is hilarious. I think the letter is the key to her identity because, as you say, Tennyson would have sent an acknowledgement letter, but the one Corelli received obviously was given a little more thought and so the two letters are obviously the same, especially as no-one else came forward with the same letter. It's so funny how the newspapers are so timid about 'outing' Corelli, when a dead poet can't claim libel!